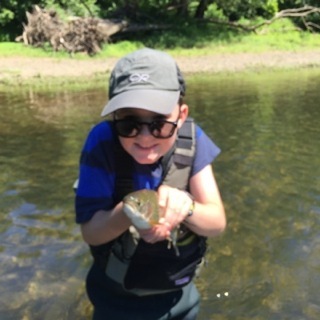 Kids can handle a fly rod with proper instruction and patience beginning as early as age 7. Private classes, full or half days, are available . Add an optional overnight camp outing ($75) and you will create a life long memory! Kids love the great outdoors so, at some point, you are sure to be out on the pond, lake or river with your favorite youngsters. Putting a rod in their hands will add to their enjoyment. I am fortunate to have a dad who loves to fish and who took me along when I was a child. I was holding a rod in my earliest childhood memory and have been passionate about it for as long as I can remember. Since starting my teaching career, I’ve had the chance to introduce numerous children to fly fishing. I have learned a thing or two about what works and what doesn’t work. In the article below, I’ve listed a few tips that will help to add to your enjoyment during the first days out on the water with your young fishing buddy.